Join Us for Our 2020 Summer Camps! IF YOU ARE LOOKING FOR A CAMP THIS SUMMER CHECK OUT THE DOLPHIN ROWING CAMP IN FLORIDA! Register siblings or sign up for both sessions and receive $75 off each registration. Must have all orders in your cart at checkout to receive the discount. If 5 or more athletes from a school or club come to camp, each member will receive $75 off. Email quakerrowcamp@gmail.com for more information. 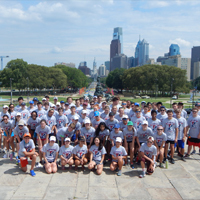 The Quaker Rowing Camp is celebrating its 12th year of business in the city of Philadelphia. We will continue to explore University City and row out of Bachelor’s boathouse, the home of Drexel University Rowing, to facilitate our 2018 Camp. This partnership will allow you to experience the day to day life of a college athlete as we spend our mid-day workouts in the on-campus training facility of the Drexel Dragons as well as the Drexel dining hall in University City, while rowing out of the historic Bachelor boathouse on Philadelphia’s Boathouse Row! Our coaching staff will continue to be made up of collegiate coaches from the Philadelphia area and around the country. You will have access to experts in the coaching ranks who will help you become a better rower and help expose you to multiple collegiate coaching styles. We are also excited to expose this sport to those of you who are “novice” or beginning rowers. Learning to row is a special process and one we take pride in, helping to lay out a foundation that will allow our campers to move forward with the fundamentals necessary to becoming successful rowers. Disclaimer: The Quaker Rowing Camp is thankful to Drexel University, Bachelor’s boathouse and the Drexel Dragons for their assistance in providing facilities and equipment for the use of our campers. 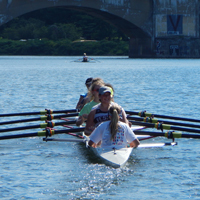 The Quaker Rowing Camp is not affiliated with, endorsed by or otherwise sanctioned by the University of Pennsylvania, Drexel University or Bachelor’s boathouse.